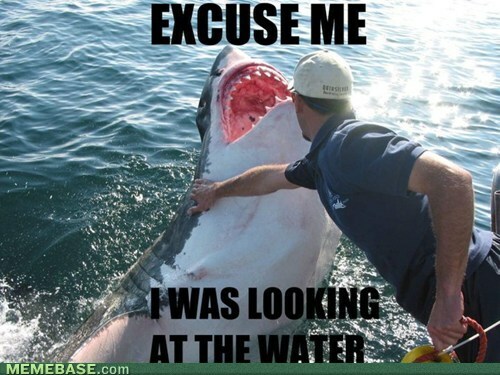 In recent years, some of my favorite ocean predators have started to show up in memes. 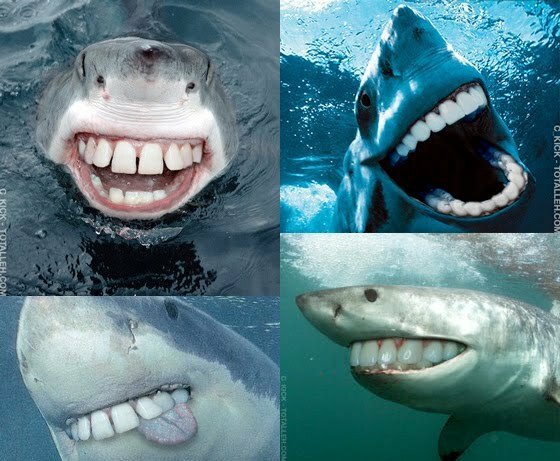 As part of our tradition of using internet humor to educate our readers, I’ve selected the funniest shark memes on the internetz, and I’ve tried to explain what’s going on in the photos used for those memes. 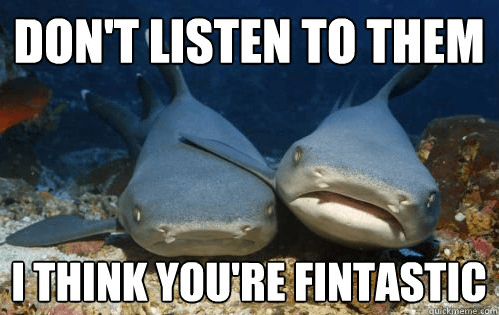 I’m happy to discuss these science and conservation issues in the comments if you have any questions, but my selection of what constitutes that funniest shark memes is obviously correct and beyond dispute. Original image source: Flickr user Yohancha. What’s going on? This shows a basking shark, the second largest shark in the world, with its mouth open wide. 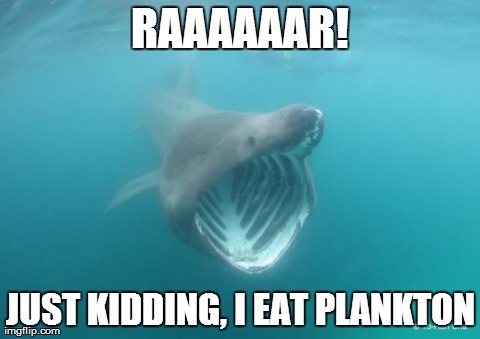 While this gaping maw may appear to be menacing, like whale sharks, the basking shark is a strict planktivore. Original image source: Paul Spielvogel. What’s going on? Though this image pretty effectively counters the myth that sharks are mindless killing machines that will eat humans as soon as they see them, you should not try this at home. 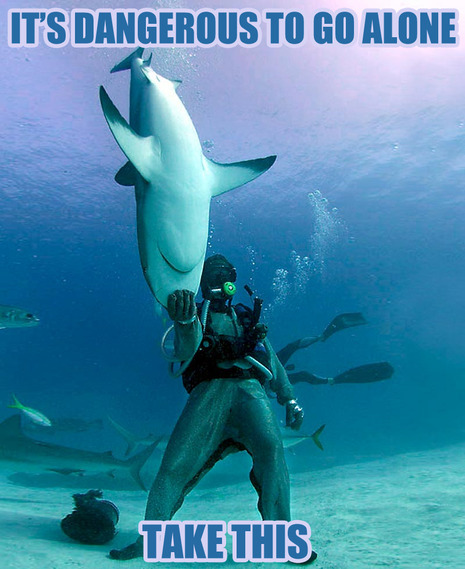 Shark diver magazine editor Eli Martinez is interacting with an individual lemon shark that he has known and worked with for years. According to the International Shark Attack File, SCUBA divers are much less likely to be bitten by sharks than people at the surface are. 10) So much awesome in just one image. What’s going on? 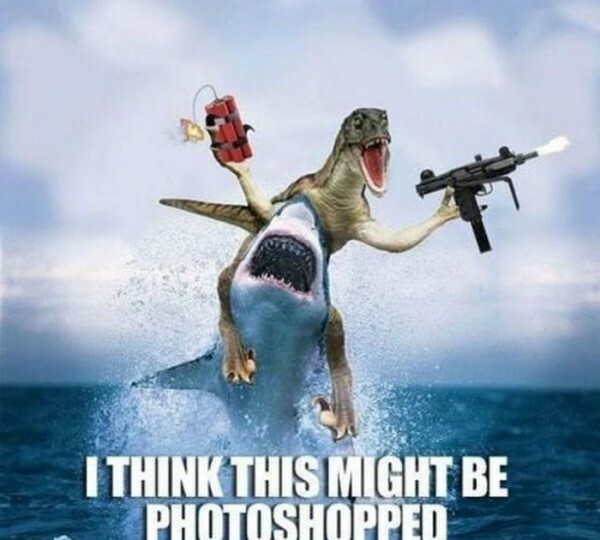 While the caption is correct, sharks and dinosaurs did co-exist for hundreds of millions of years and occassionally interacted. Original image source: From the documentary “SharkMan” (about Michael Rutzen). What’s going on? This shark is experiencing a phenomenon known as “tonic immobility,” a kind of induced temporary sleep. 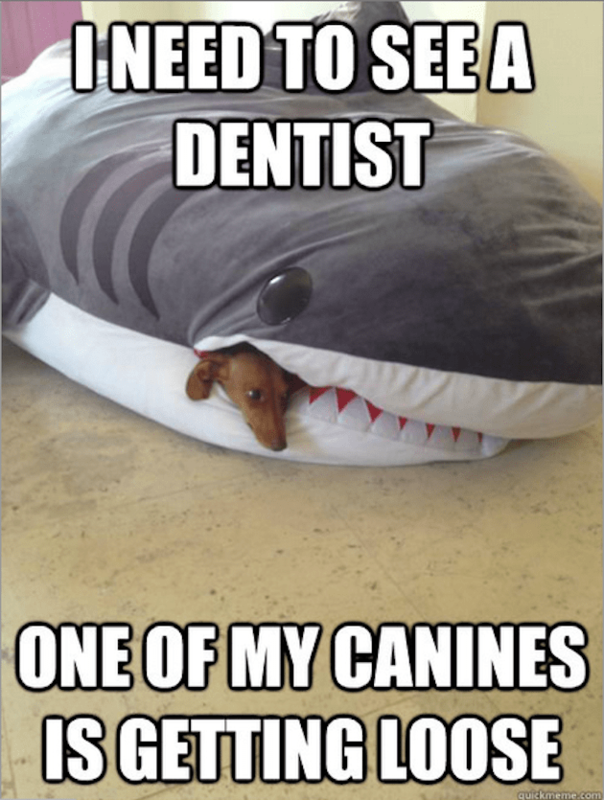 Some shark researchers take advantage of this to work with their study animals more safely, though it is known to cause physiological stress to the sharks. 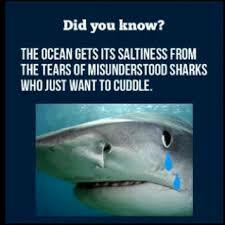 8 ) Even sharks can have a bad day. Original image source: Cannot determine, assistance would be appreciated. What’s going on? While the shark on the right is unlikely to be comforting his friend with a pat on the head, some species of sharks do have surprisingly complex social interactions. There are social hierarchies, “friends”, and even social learning. What’s going on? While there actually are animals called “shysharks” and “nervous sharks” , this is a thresher shark. The large eyes help with hunting in low light conditions. If you haven’t seen the awesome video of thresher sharks stunning prey with their tails, you should watch it. Now. I’ll wait. 6) Loose canine! Get it? What’s going on? While this is not a picture of one, contrary to the opinions of some, dogfish actually are a kind of shark. There are important conservation issues associated with one species of dogfish here in the U.S. Original image source: Cannot determine. What’s going on? Sharks false reputation as bloodthirsty mindless killing machines, perpetuated in no small part by images and videos of them eating prey with their fearsome teeth, has negatively affected conservation efforts. 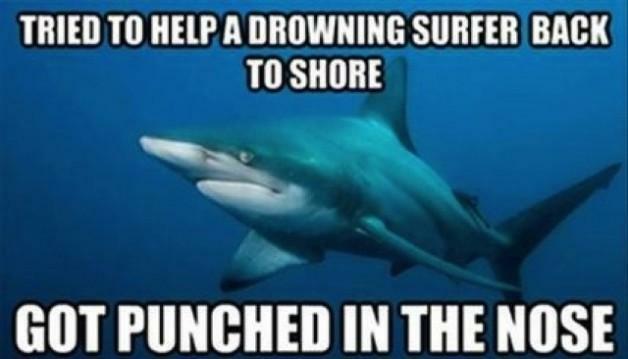 4) Shark to the rescue! Original image source: Andrew Fox. What’s going on? SCUBA diving ecotourism is an important worldwide business, which can be important for conservation. 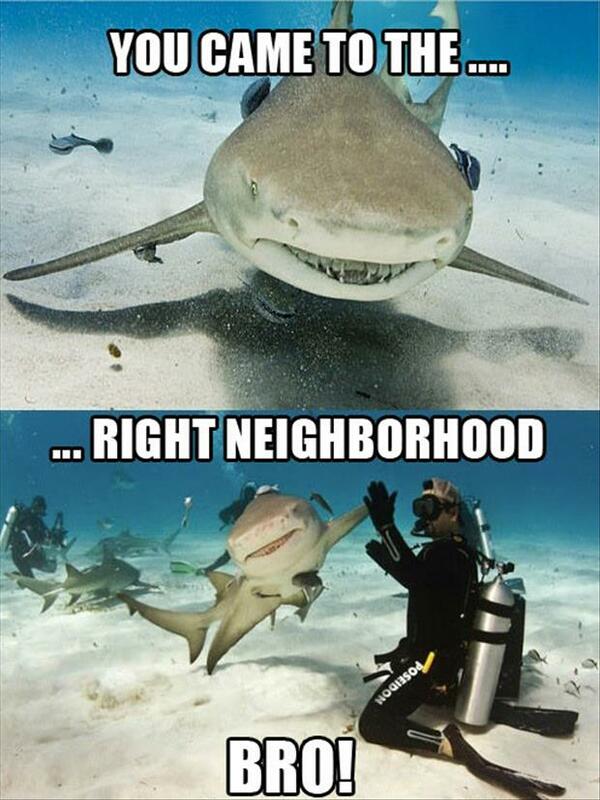 In certain situations, a shark can be worth more alive (to SCUBA divers) than dead (to fishermen). What’s going on? There’s no question that sharks are among the most misunderstood animals in the ocean, and that this misunderstanding has negatively affected conservation efforts. What’s going on? Actually, the ocean’s saltiness comes from a combination of runoff from land and minerals from hydrothermal vents. 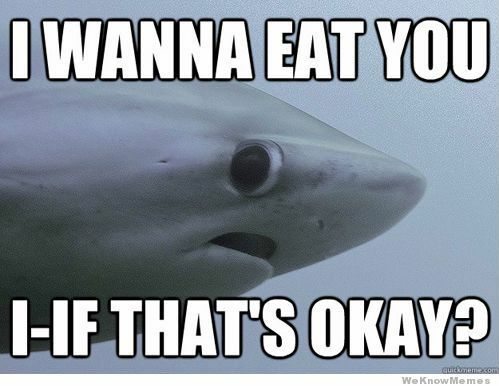 1) This is unquestionably the greatest shark meme on the internet. There is no debate about this. Don’t even think about it. What’s going on? This one’s just plain funny. Thank you! Do you have a link that documents this that I could use? Nicely done David! I laughed all the way down 🙂 love the fact that you took the time to explain those memes teasing peoples’ inclination of their perception of the ocean. Nevertheless, may I quickly add something to 8) maybe it would be a nice move to add the serious issue we have with shark finning. What do you think?